If you are looking some place to escape from confusion, we are the best answer with the private room near the beach of Koh Tao. You will meet peace, happiness and beautiful place at here. It’s a good idea to creating a romantic atmosphere for your lover by rest on the soft warm bed. 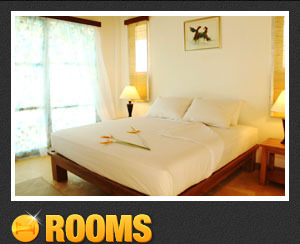 Koh Tao Hillside Dive Resort offers several different levels of comfort to fit your budget and expectations. All rooms come equipped with a refrigerator, Cable TV. In our intimate island restaurant, our guests enjoy some of the best Thai cuisine in the Gulf of Thailand. In between swims, enjoy a refreshing drink or cocktail at our beach bar. 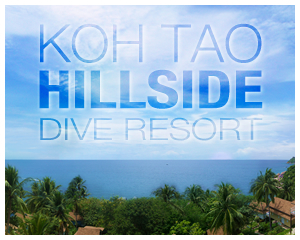 Koh Tao Hillside Dive Resort is located on the Aow Taasak bay of Koh Tao, located across from Koh Nangyuan on Koh Tao. The resort overlooking Koh Nangyuan clearly. Koh Tao Hillside Resort is ideal for those who want quiet. Because the resort is surrounded by nature is still abundant. In addition, they can also watch the sea at the same time. Or one who likes swimming in the sea, you can come to the front resort. This is a small sandy beach, with a length of about 25 meters. Book with confidence knowing you’ll get our best rate available.